One of the greatest advantages of not being constantly immersed in the percussion world is that I am not swayed by the way it operates. This may sound a little strange to percussionists, but probably not so strange to everyone else. To put it another way, not being a part of that world enables me to think more like other musicians, such as classical string players. Violinists are a good example. When professional violinists pick an instrument to play for life, they are usually more concerned with the way the instrument sounds and less concerned with who made it. Obviously, they will initially pay more attention to an instrument with a famous, recognizable name such as Antonio Stradavari or Giuseppe Guarnieri, but of they are smart, they will ultimately try to pick the best-sounding instrument they can afford. Since many of the famous makers have been dead for hundreds of years, their finest instruments continue to be well known for their sound, not by paid advertisements in magazines. "Classical" instrumentalists other than percussionists are not subjected to the same pressures from advertising that percussionists are. One reason for this is that percussionists usually buy many, many different instruments and products so there are lots of companies that can co-exist and survive; there is a massive market for percussion equipment. Many marimbists also play many other percussion instruments, so they are constantly looking for equipment. Being influenced by percussion advertising as a percussionist, at least in the U.S., is generally unavoidable. Some of the companies that sell drum sets also sell keyboard percussion instruments. These "all in one" companies pour the same kind of advertising know-how into selling marimbas as they do in selling drum sets. To illustrate this point, pick up any issue of Percussive Notes or Modern Drummer and you will notice that these percussion-oriented magazines are crammed with vivid, colorful ads. Although most of these ads are geared toward pop culture oriented instruments and products such as drum sets (particularly in Modern Drummer), you can often find ads for keyboard percussion instruments that are just as eye-catching. My main point here is that percussionists are often very influenced by advertising and outside influences, without even having ever heard the instrument by the maker they are considering. In a sentence, slick advertising directed toward percussionists often spells success for the manufacturer, but also potential disaster for percussionists. When I say that I now try to think more like a classical string player and less like a percussionist, what I mean is that I now stop thinking about issues that seem to get in the way of the most important issue—the sound. Factors such as the brand name, peer pressure, advertisements, endorsements, price, how the instrument breaks down and even how the instrument looks become less important. What becomes crucially important, when we strip away all of the ulterior influences and considerations, is the actual sound of the instrument. Therefore, I feel lucky: since I am a composer and spend most of my time outside the percussion world, I feel emancipated from the hurricane of influences that typically get crammed into many percussionist’s heads. If percussionists are truly excellent, they are not swayed by advertisments and only seek out instruments based on how they sound. Even though young percussionists are sometimes swayed by non-musical influences, most great players are usually not. However, it is difficult, even for professionals, not to be influenced by price, the beauty of the instrument and endorsers who's opinions you respect. As for price and reputation, string players have it tough: these instruments go for anywhere from a few thousand dollars for a mediocre instrument to millions of dollars for an antique by Stradavari or Guarnieri. Marimbas currently do not usually sell for more than $20,000. String players do, in fact, sometimes pick instruments based on the maker and its resale value rather than the sound. Also, violinists have the luxury of determining whether an older violin revealed itself to be either a great or poor instrument over a long period of time; percussionists do not currently have that luxury, at least over that length of time. String players are sometimes wary of buying new instruments for this reason. It is a complicated issue! It should be obvious that unless you are very wealthy or have incredible donors, buying a stringed instrument is a different experience altogether, even though there are a few minor and/or general similarities. In the purest sense, I am most concerned with eliciting the best sound possible from my instrument. What I really care about most is portraying the intensity of the music I am playing. Simply put, I want to play the best music I can find on the best instrument possible: this is why I chose a marimba made by Douglas DeMorrow. Anyone who has ever seen a new DeMorrow instrument knows that they look fantastic. When they are heard under the right circumstances, tuned properly and taken care of, they also sound absolutely amazing. If you were to make a comparison to food, you could probably compare the sound of a DeMorrow marimba to fine, gourmet meal. If food could make a sound, listening to a DeMorrow marimba is like listening to a box of the finest chocolate truffles—like listening to something that melts in your mouth and prompts you to eat more than you probably should. Many percussionists try to gauge how a marimba sounds when at a convention such as at the yearly, American Percussive Arts Society International Convention (PASIC). Unfortunately, these conventions often cram many instrument makers next to each other in spaces that are usually not the ideal places to hear how marimbas sound,.Marimbas should be placed in concert halls, properly tuned, with no distractions. Of course, this is not usually possible. Recordings will also probably not give you a satisfactory impression of DeMorrow’s instruments, although you will get a sense. Depending on various factors such as the microphones, the recording space and whether artificial reverb was used or not, you are probably going to be mislead. The only true way of hearing if an instrument is great or not is to put that instrument in a nice hall, with you standing in front of it, playing it yourself. Or, alternatively, you can be in the audience while someone who knows what they are doing plays it so you can hear how the sound carries. Either way, you need to hear the instrument in a live situation with your own two ears. When I was trying to decide whether or not to purchase a DeMorrow instrument, it was somewhat difficult because there are so few of them and also because he makes them by hand. I had a difficult time locating one of his recent instruments to try out. I eventually found two, but both were older instruments that are a little different from the ones he makes now. If I had to make a comparison, I would say that DeMorrow is currently making instruments that are equivalent to the violins made by Stradavari during his best period. To me, DeMorrow marimbas sound that good! I even know a famous marimbist who endorses another major brand that admitted that he thinks my instrument sounds absolutely amazing and looks amazing as well. However, there are other reasons—aside from the incredible sound—to pick a DeMorrow marimba. As I mentioned earlier, they look amazing. They also have tight-fitting, extremely accurate tuning caps on every single resonator. Doug is also very easy to work with and will make a marimba to your specifications. 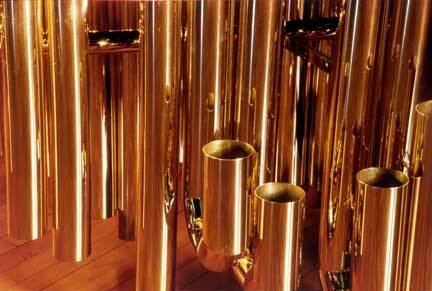 The newer instruments are height adjustable and the resonators can look the way you want them to look (even with polished brass, as seen in the photo of some of my resonators below), the tuning you want (i.e. A 440, A 442), etc. DeMorrow instruments also pack well and the frames do not rattle. I think this is an important consideration: that last problem you want is for your instrument to rattle during a concert or recording session, and his instruments are built to completely eliminate rattles and other noises. He is even working with a case maker and now has custom soft cases available so you can travel with it and not worry about scratching or damaging the finish. DeMorrow also makes xylophones and is also now making vibraphones. If you are a keyboard percussionist who plays these other instruments, you can have the luxury of playing one of his fine vibraphones or xylophones as well. I have not seen his vibraphones yet, but from what I have heard through the grapevine, they are amazing. When choosing my marimba, I needed to think hard and make a conscious decision: would I purchase a concert keyboard percussion instrument the same way I would purchase a kitchen appliance, or would I pick a new instrument because I am in love with the way it sounds? I chose the latter. After hearing various instruments and many different brands over the last few years, the choice was clear: I chose a DeMorrow marimba. By the way: Doug DeMorrow in no way influenced me to write this. I wrote this article simply because I love the marimba he made for me, and I would recommend his instruments to any percussionist looking to purchase one of the finest marimbas available.